Hi everyone! 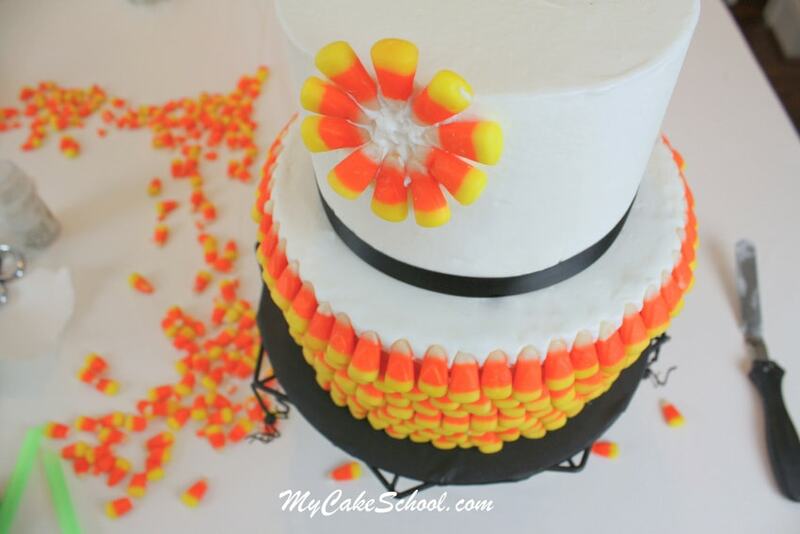 I’m excited to show you today’s Halloween design because it is super simple to create and has a surprisingly dressed up feel for something that relies so heavily on CANDY CORN! 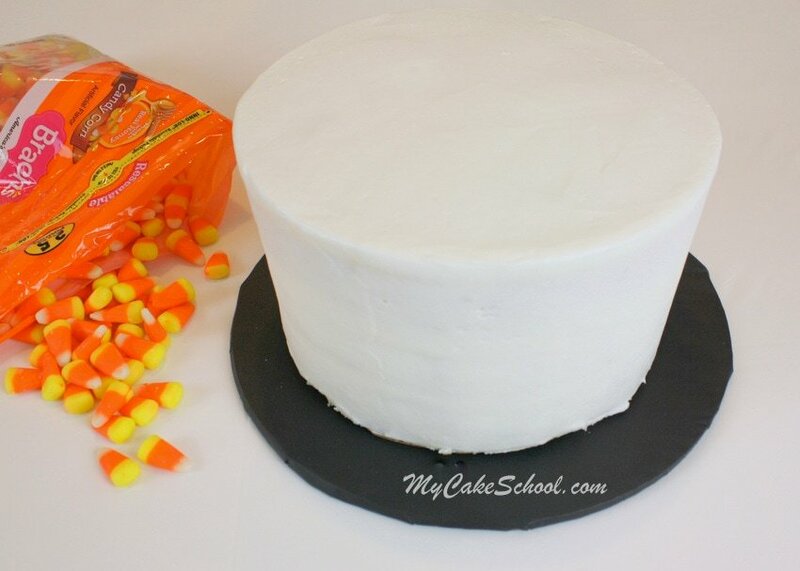 This sweet staple of Halloween isn’t exactly considered “fancy”… but we’re about to change all of that with a dressed up novelty cake that will be perfect for your Halloween entertaining! My 2.5 pound bag of Candy Corn is ready!! Starting at the bottom, I pressed in my first row of Candy Corn. Then, I added another row, so that the upper row slightly overlaps. 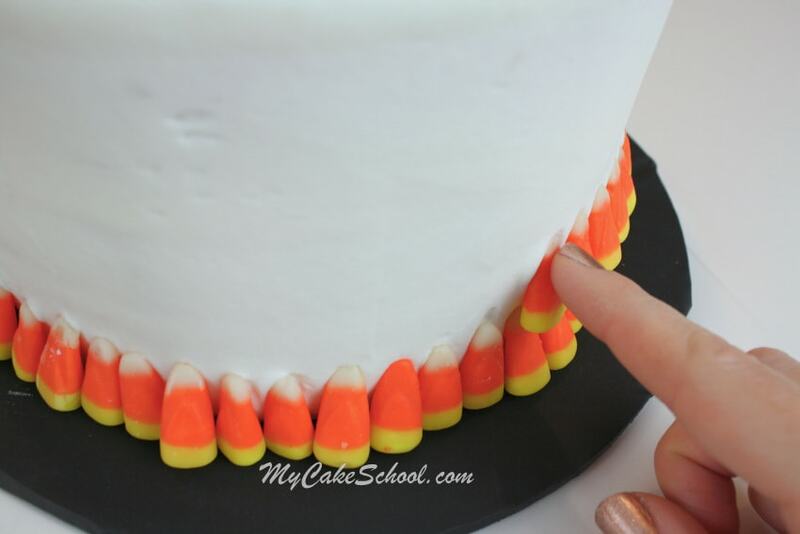 A little bit of an overlap is good….if you overlap too much, your Candy Corn will have less contact with the frosting which is the “glue” that holds everything in place. I also slightly staggered the next row but that’s optional–it would look good either way! Then another row, and another, and another ;0)……..
…until we reached the top! After placing 4 bubble tea straws (or your dowels/supports of choice) into the bottom tier as usual, I placed my 6 inch tier onto the cake. A black ribbon served as an easy border. 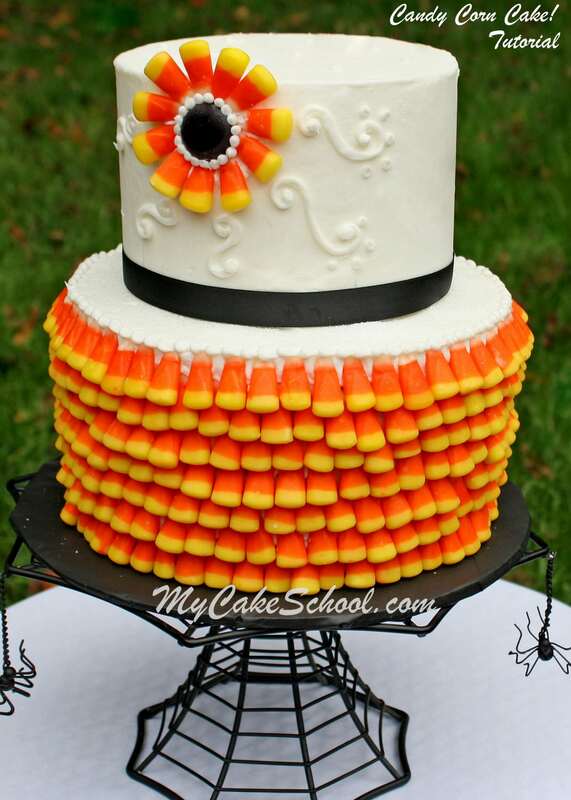 Then, I pressed several candy corns into the top tier, forming a flower. I placed it high on the left side, so that the top “petals” extended past the top edge of the cake. You can use some creativity with the center of the flower. I went the simple route, using a single Wilton black candy melt…but a sprinkle or dragee center, frosting, or other candy center would be great too! 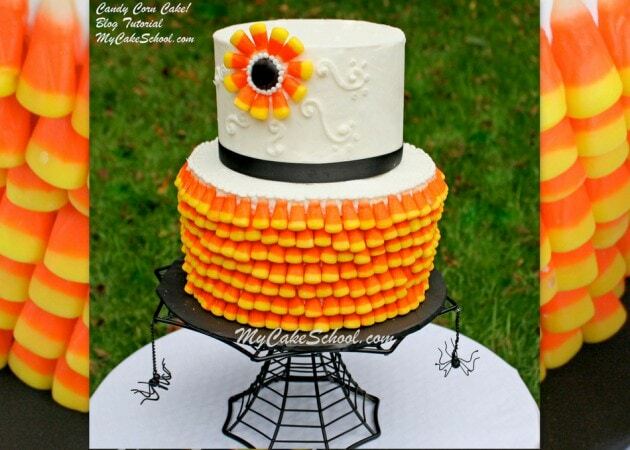 Our cake is resting on a new Halloween cake pedestal that we just bought at Sur La Table…but no matter what your base or pedestal is, the cake is truly the star of the show! Hi Simone, candy corn is popular sweet treat during Halloween and Thanksgiving……it is shaped like a kernel of corn. This is such a lovely idea! 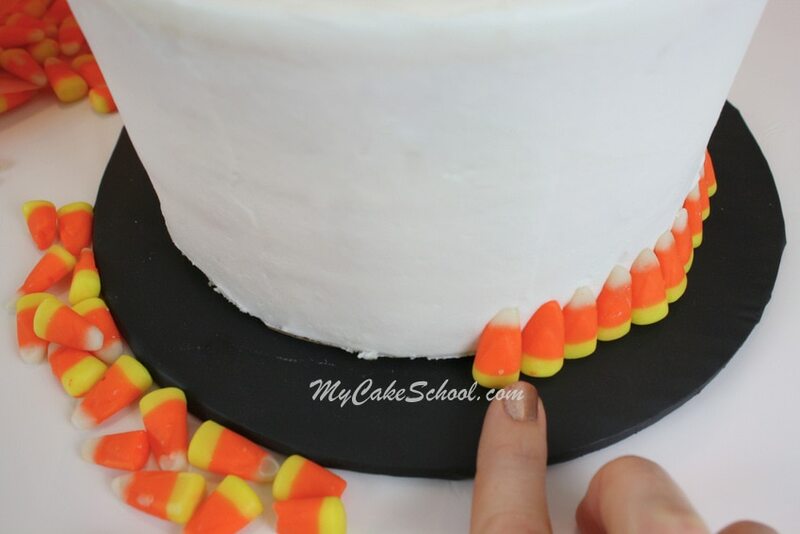 And so easy and quick to do too :D I wonder, we can use just about any other candy for this one and change the theme! That is great! Love it! And now all I have to do is buy 2 bags of candy corn since I will eat one entire bag during the decorating process. As always, thanks for sharing! As all your creations are, this cake is just adorable! I wanted to ask, though, about your experience with candy corn. Last year I made cupcakes for Thanksgiving that used candy corn. I made them the night before and was shocked that when I was ready to use them the next day that the candy corn broke down (most either broke or just disintegrated). I must have been the sugar or butter in the frosting that reacted with the corn syrup used in the candy corn??? I don’t know but I would hate to make this beautiful cake and have that happen. Any thoughts? Really cute! Amazing what you can do with decorations made with candy. 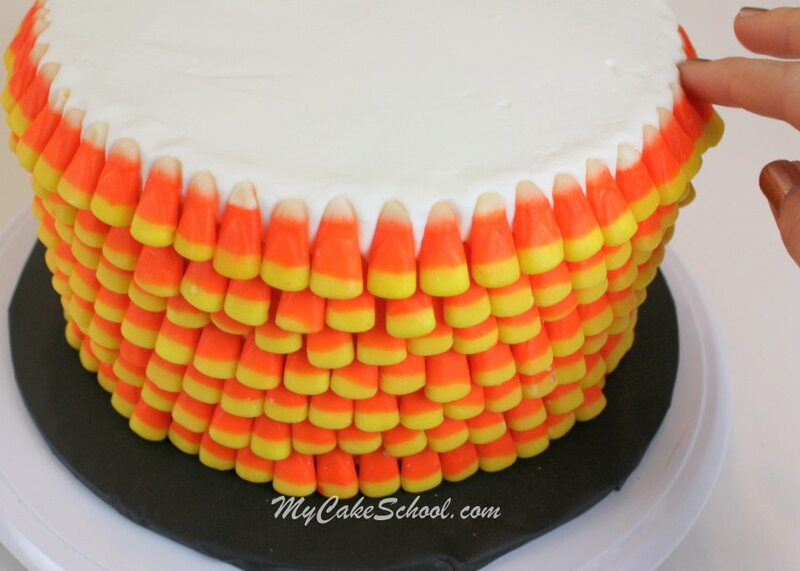 The Candy Corn cake is still on our countertop (not ready to part with it yet- ha!) 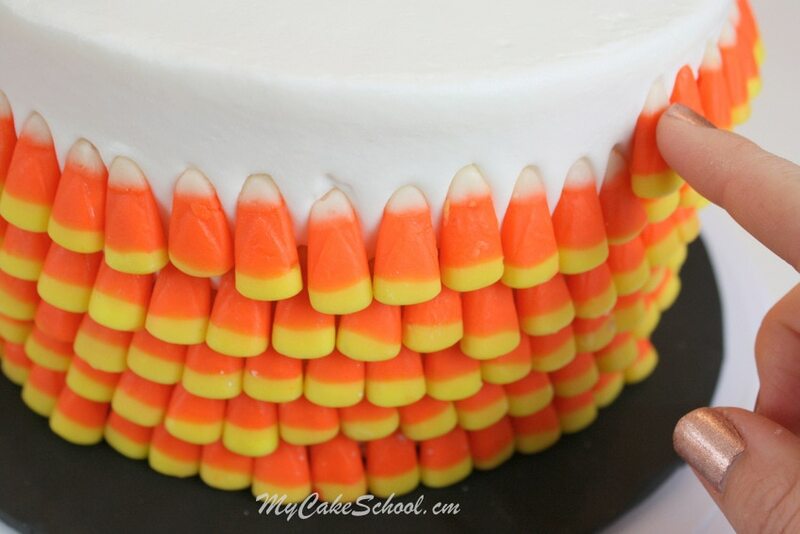 — And so I can tell you that at least with the Brach’s candy corn that we used, and the crusting buttercream recipe, everything still looks the same. What I can’t tell you is how this would do in the refrigerator or with a non-crusting frosting recipe, since we don’t have any firsthand experience. I guess as with anything else, a trial run (Candy Corn on a frosted plate) will give you peace of mind. Thanks for posting! Simple and beautiful…. 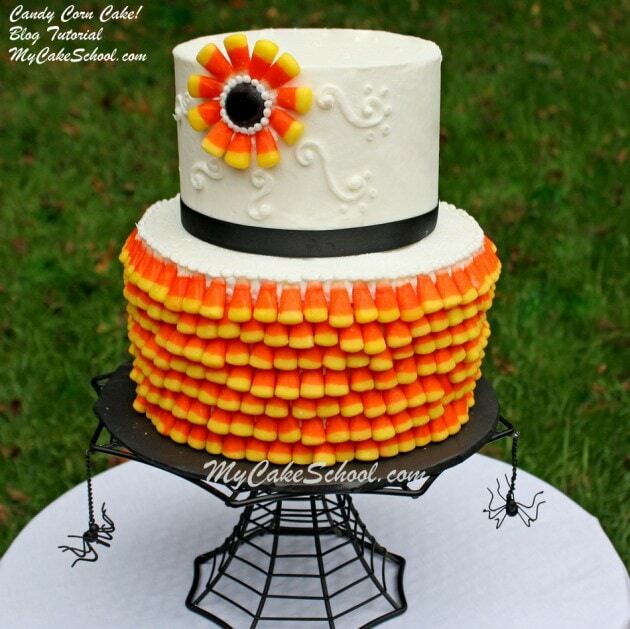 I love your cake stand.. where did you get it?… Thank you..
That is going to be one rich cake with all that candy corn! Pretty design! Que torta mas hermosa colorido y delicioso,Me encanta, Muchas gracias por compartir.Que el Dios te bendiga hoy y por siempre. Thanks 4 sharing and I think I will try this one. Thanks again!!! My 2.5 year old son saw me looking at his blog post and fell in love with your cake design. He was so cute asking for “my canny corn cake” that I had to make a version of it for him. Thanks for the great idea! 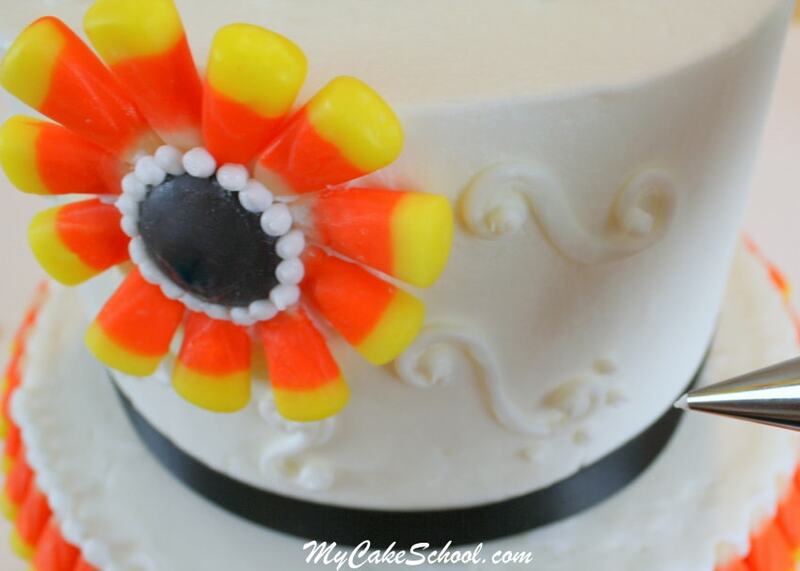 Candy corn is a marshmallow based candy; made much like Marshmallow fondant. In fact, it is just that with a edible wax coating. Very nice & colorful. It really looks tasty. I will surely try this.